We recently visited a new local play park with so much more to offer than just play. Kids Wonder mixes the inflatables of Monkey Bizness, with the pretend play of the Children’s Museum; plus resources like classes for parents and children . I’ve been to more play parks than I can count in the greater Denver area and this one is unique in the abundance of resources they are offering to local families. Sitting down with the owner made me excited to see the programs this place will expand and include in the future. The entire play park feels secure and well monitored. With staff constantly circulating, one entrance/exit, as well as cameras monitoring this place is one of the few of its kind I felt comfortable letting my son out of my sight. When walking into Kids Wonder you are greeted by a small entry area with cubbies and a small toy stand. This is the only area outside visitors are allowed, which makes the play area feel even more secure. The staff was friendly, knowledgeable, and enthusiastic. I love the fact that there is one entrance/exit that is monitored by staff. The decor in the entry area is informative about all the resources Kids Wonder has to offer. They are focusing on not only Play, but Learning, and Partying as well offering classes and birthday party packages. The first thing you see upon walking through the gate is the imaginary play area; designed to look almost like a street with little ‘shops’ that are each stations for pretend play. It was clearly designed with children in mind and outside of being new, it was one of the best kept play areas I’ve seen in the area. The owner shared with me she got the shorter walls for this set up from a local Babies R Us closing. It’s a very clever use of space and creates lots of individual play areas in one larger space. The benches down the middle were a perfect place for moms to sit and watch their kids explore. I particularly loved the construction room, this area also offered rooms like firefighter, grocery store, vets office, puppet show, school room, and more! If your child loves pretend play this is one of the best set ups I’ve seen in the Denver area. While as a mom I’m a big supporter of pretend play this wasn’t my sons favorite part of Kids Wonder. He’s an inflatables junkie, as most little boys are. He instantly found the small bounce house in a section designed for younger children. Lucky for him he was barely within the age limit and I allowed him to jump there until we found the jackpot. The inflatables room in the back was a dream come true for my little man when we found it. It’s tucked away a bit, which is nice because it allows the noise of imaginary play and the noise of inflatables to stay separated. 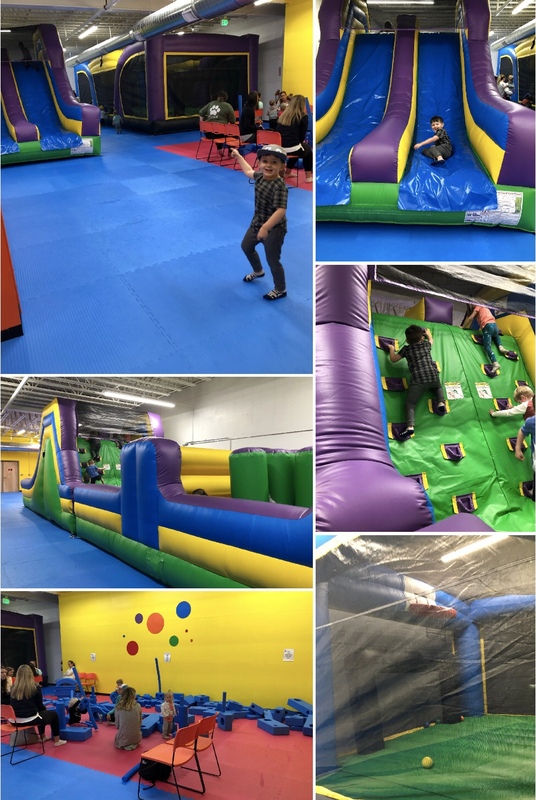 There are two large inflatables in this back room in addition to a foam building area. This room was where my son wanted to stay, he did the obstacle course slide over and over. Large inflatables usually make me very uncomfortable but this set up was easy to see my son playing at all times and felt safe. In addition to these two large play areas Kids Wonder is well equip for younger children as well. On one side of the Imaginary play lane is smaller play equipment with a padded floor as well as a separated crawlers play area. These smaller kids play areas make Kids Wonder a great destination for kids of all ages. Beyond catering to younger children with their facilities the owners offer several classes depending on if your child is walking, crawling, or scooting. Check out the many classes they offer on their website HERE. Wear socks, this is a shoe free play area. Outside food is not allowed so be prepared to buy snacks or have a hangry (hungry and angry) kid like I did.